SNOW???? In October??? Yes, it is hard to believe that Jim and I were out in the garden this past weekend picking our last green and sweet bell peppers and 3 days later it is was snowing on the morning drive to work! I guess it isn’t that surprising – we do live in Ohio. Like the old saying goes, if you don’t like the weather here, stick around a day or two, it will change. 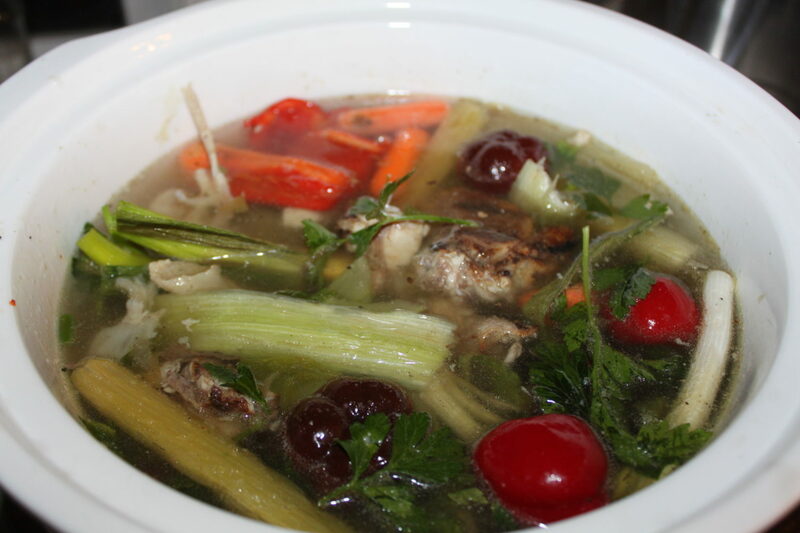 As an added bonus, you can use the leftovers to make your own, healthy chicken stock. This week’s cold weather got me in the mood to make old-fashioned comfort food. Chicken and noodles over mashed potatoes, rustic chicken noodle soup, potato soup….you get the point. As the temperature decreases, the need for stock increases. That doesn’t mean go to the grocery and open a box or can and pour it in. 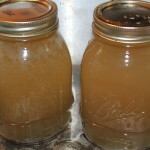 I am talking about pure homemade broth made from the leftovers in your kitchen. It is one of the easiest canning recipes that you can make! This week was a perfect time to pull out those lonely celery stalks, scraps of onions and carrots, and even the garlic scapes that have been taking up room in the kitchen freezer for the last month. Use as many vegetables as you want to make a vegetable stalk, or if you have leftover chicken bones, throw those in for traditional chicken broth. 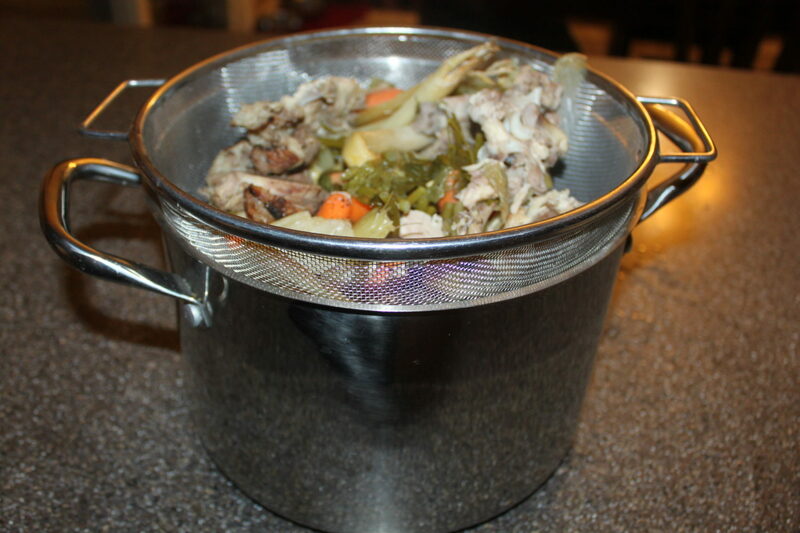 Although you can freeze stock – today I wanted to use my pressure cooker one more time – a sort of send off to the canning season – and also save valuable room in our freezer! Can’t wait to bring it back out in the spring!!!! **amounts not specified because it depends on what you have on hand, and how your like your stock. Ours never turns out the same but it is always delicious and flavorful! Making stock is a great time to use up all of those leftover veggy scraps! 3. Strain liquid in another large pot and bring back to a boil. 4. Place liquid in heated and sterilized canning jars – add a heated lid and ring and place in pressure canner. 5. Follow your instructions for your pressure canner and process quart jars for 25 minutes at 10 lbs of pressure (altitudes less than 1,000 feet), and pint jars for 20 minutes. 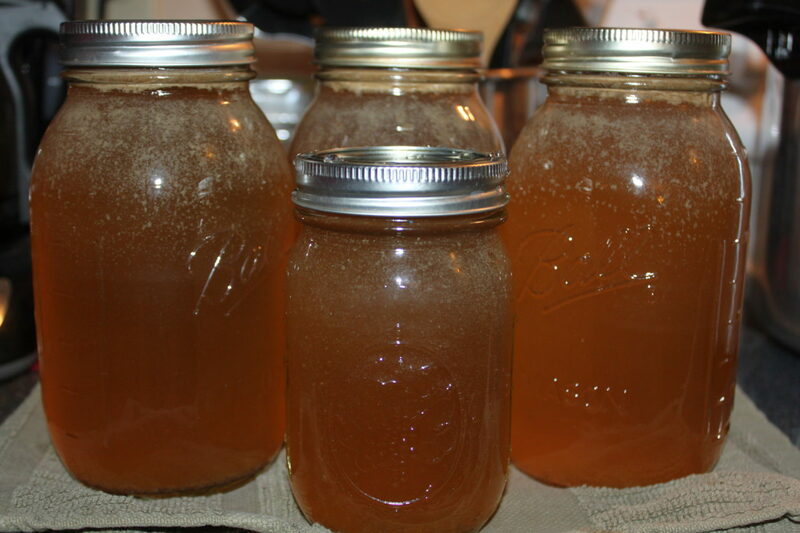 ***Option – if you don’t have a pressure canner don’t worry – you can still freeze your broth — Just place cooled broth in a freezer safe container. Check out how we froze ours here. **amounts not specified because it depends on what you have on hand and how your like your stock. Ours never turns out the same but it is always delicious and flavorful! Strain liquid in another large pot and bring back to a boil. Place liquid in heated and sterilized canning jars - add a heated lid and ring and place in pressure canner. Follow your instructions for your pressure canner and process quart jars for 25 minutes at 10 lbs of pressure (altitudes less than 1,000 feet), and pint jars for 20 minutes. ***Option - if you don't have a pressure canner don't worry - you can still freeze your broth -- Just place cooled broth in a freezer safe container. ← Farm Basket Winners Announced, A Class Visit To The Farm, And The Cabin Has A Name!